The Rinkha, Islandmagee, 'Picture By: Arthur Allison, Pacemaker. 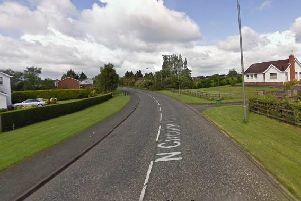 Police are appealing for witnesses following a burglary at The Rinkha, Middle Road, in Islandmagee, during the early hours of this morning, Wednesday August 9. A quantity of cash and cigarettes were stolen after entry to the premises was forced around 1.00 am. Detective Sergeant Crothers said: “I would appeal to anyone who may have witnessed this incident or anyone who has information which may assist police enquiries, to contact Detectives at Larne on 101, quoting reference 62 09/08/17. Ulster Unionist MLA John Stewart has hit out at at those responsible for a break-in at The Rinkha, Islandmagee, last night. The burglary at the Middle Road shop and well-known ice cream retailer, is believed to have occurred during the early hours of this morning. In a comment on social media, Mr. Stewart said: “Those responsible for this have zero considerations for their actions and how it affects the family business. “As someone who has been a victim of a similar incident, I know just how distressing and frustrating it can be. In a statement, DUP MLA Gordon Lyons said that his thoughts are with the owners and staff of the Rinkha. He added: “The community in Islandmagee is in shock at the news of this robbery. The Rinkha is a popular destination boasting customers from across Northern Ireland who travel to taste its renowned ice cream. “This is a deeply frustrating time for the owners of this popular family-run business who have had to deal with the burglary and the clean-up today. “Those who carried out this criminality should be brought to justice and if anyone has any information that might help this happen they should contact the PSNI.